How often a balcony turns into something like a barn or storeroom. It is there that the somehow unnecessary things are stored, which have become superfluous in the rest of the apartment or house — maybe it will come in handy someday. 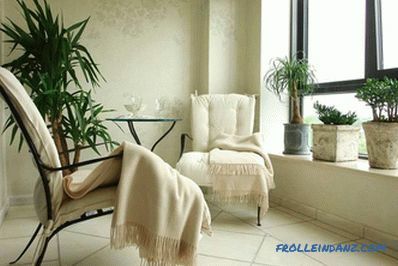 But the balcony can be a full-fledged room where it is pleasant to spend time. It is important to think about the design of the balcony outside and inside, because its appearance must be presentable not only for your eyes, but also for the eyes of passersby, your neighbors and guests. Before taking any steps to transform a balcony, it does not stop to ask about the condition of the balcony slab. That is what determines your initial capabilities. 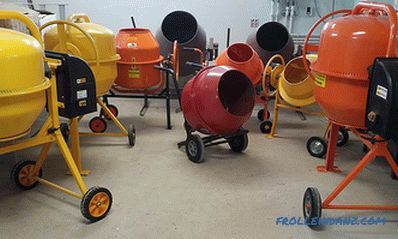 You may need to repair it, i.e., fill the screed, or more drastic solutions. We have already mentioned that it is possible to organize on the balcony, now let's take a closer look at each of the 12 balcony decoration ideas. 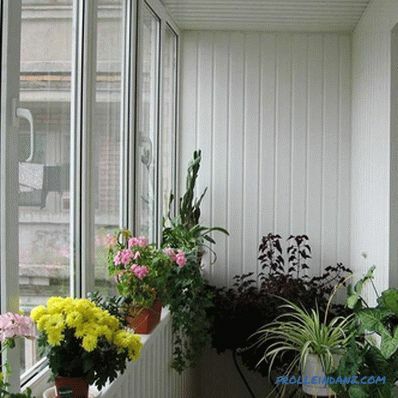 When arranging a winter garden on the balcony, you must immediately kill two birds with one stone: create suitable conditions for the plants and not forget about your own comfort and aesthetic pleasure. Remember that plants may need additional warming, hydration and lighting. 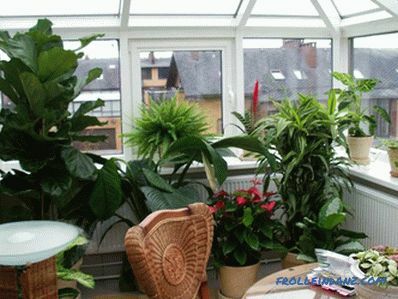 For a greenhouse, any heated balcony with warm glazing is suitable. The choice of plants depends on how high the temperature can be maintained in winter. Plants should not block each other; everyone should have enough light. With the help of the backlight, you can select important compositional elements. 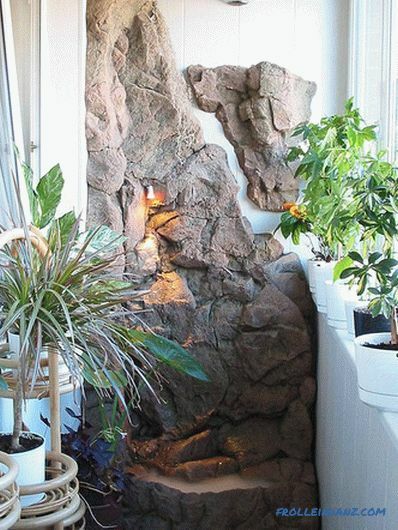 The type of plants should correspond to the peculiarities of natural lighting. As you know, there are light-loving plants and shade-loving. If during the day the balcony is illuminated by too bright sunshine, it is necessary to hang blinds or curtains on the windows in order to regulate the luminous flux. If flowering plants are selected, then it is better to pick those that bloom at different times. 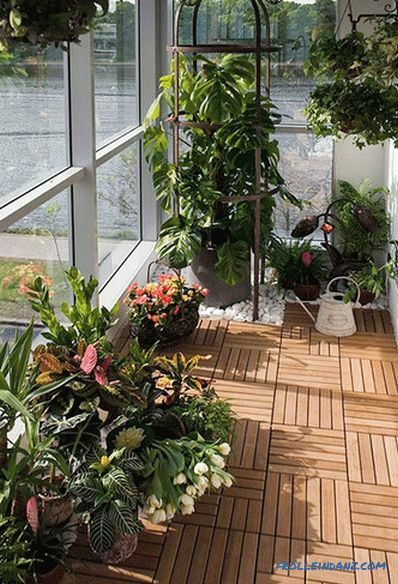 Plants can be grouped around a single large one or supplemented with a composition of plants in hanging baskets, which allows you to intelligently use the space on a small balcony. 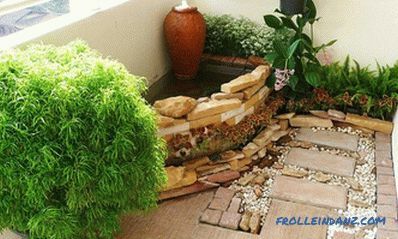 If there is very little space, put pots or make a vertical garden. Wicker furniture is often present in the winter garden on the balcony For example, a rocking chair. 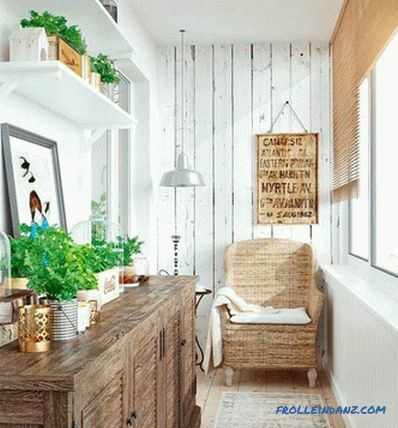 Wicker texture looks good in combination with green plants. 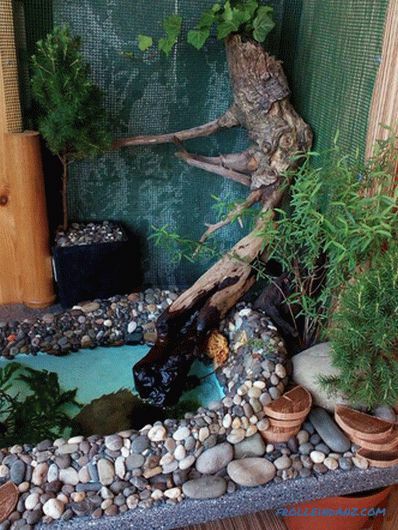 Natural materials such as wood and stone are used for decoration. 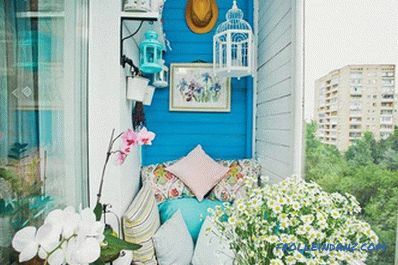 If there is enough space on the balcony, you can decorate it with additional elements, for example, small garden sculptures or set up a table for tea drinking. 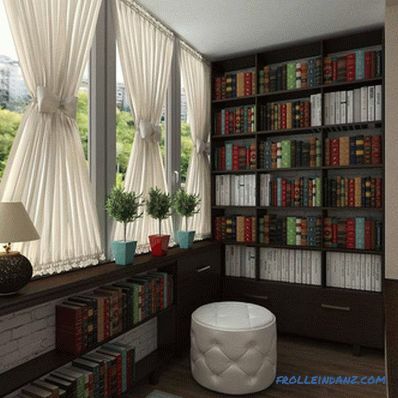 You can equip a full-fledged cabinet on the balcony or loggia - this solution is quite popular. 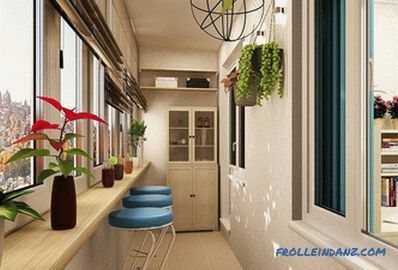 The cabinet is made only on the insulated and glazed balcony, and the glazed is not somehow, but with the help of double-glazed windows. 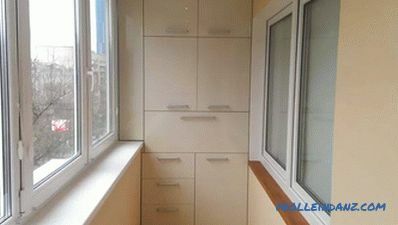 Some details depend on whether the cabinet is isolated or attached to the room: firstly, the level of sound insulation, secondly, functionality, and thirdly, the need for heating on the balcony. It is impossible to take a battery working from central heating to a balcony by law. Often the problem of heating is solved by installing a heated electric floor. Choose discreet pastel colors or not too dark warm shades.Do not perform finishing with bright and saturated colors: they will distract from the work, cause stress. Illumination of the working area should be sufficient, often use spot lighting, complementing it with mobile luminaires with fasteners-clothespins. 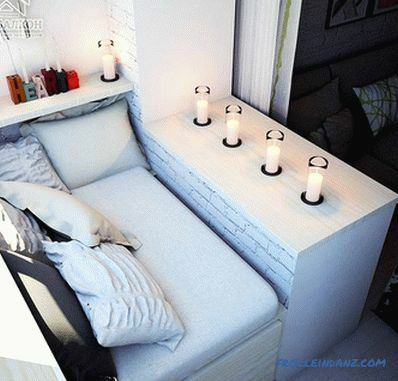 It is desirable to make it so that it was not sent to the room, especially if the balcony and the room are combined. 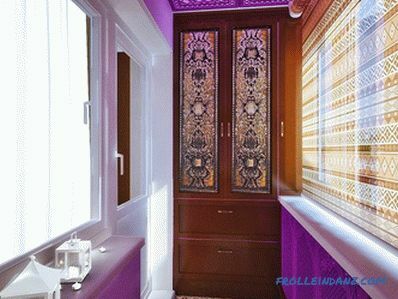 If the cabinet is insulated, then it is better to hang blinds or thick curtains on the windows so that the light from the cabinet does not prevent the household from sleeping if it is necessary to work late in the evening or at night. 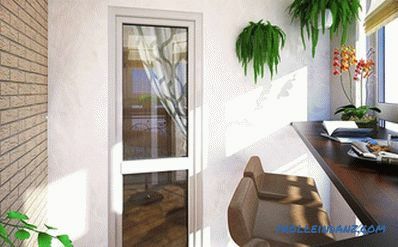 Paint, plaster, plastic panels, wall paneling or decorative stone are used as finishing materials for the walls (the weight of the wall will be significant, so when you finish the whole balcony with stone, you will need to reinforce the plate, as a compromise you can finish one of the narrow walls, for example, where there will be a desktop. On the floor you can put linoleum, laminate or tile - it all depends on the chosen style. 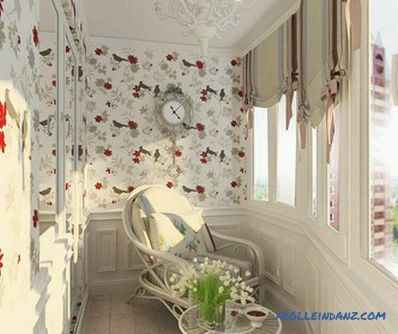 By the way, for the design of the cabinet on the balcony often choose the classic style, high-tech, loft, eco-style. 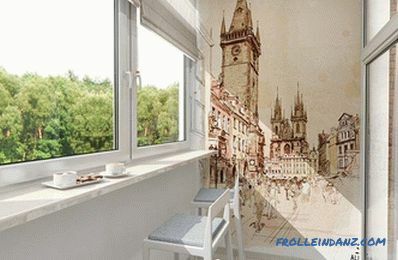 balcony attach to the room, it should be made in the same style and color. 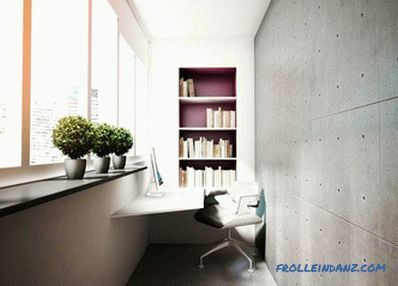 Furniture for the study on the balcony should be chosen simple, but functional, with convenient, but not bulky drawers. 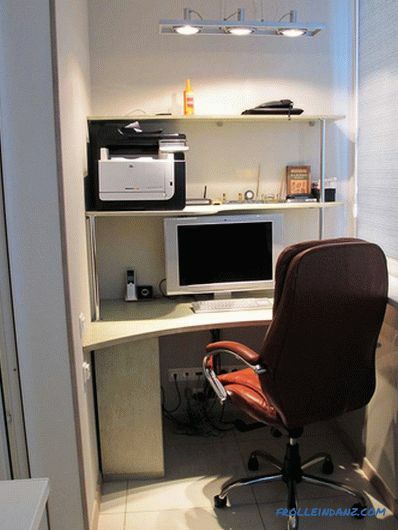 There should be a place for office equipment, books and manuals, documents, stationery. Sometimes the office and the recreation area are simultaneously organized on the balcony. 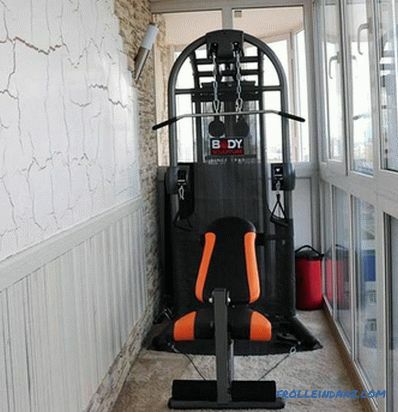 Organizing a gym on the balcony will have to face some difficulties, and the main hitch is the limited space. Here you can practice on simulators, yoga and meditation. If you train on simulators, not every simulator will fit on a narrow balcony or loggia, in addition, you must take into account the load on the balcony slab. For example, a treadmill for an ordinary balcony would be a bit heavy. Can be installed on the balcony wall of the Swedish - the best place at the end wall. However, do not clutter the space with sports equipment, leave a free zone for warm-ups and exercises on the floor. 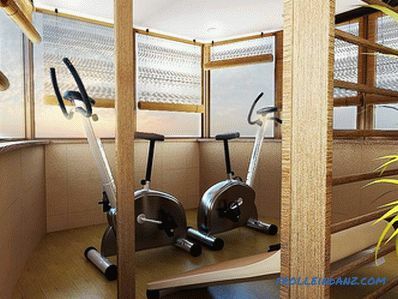 To design the gym on the balcony, choose natural colors, for example, beige, green, blue. Natural materials are also relevant as finishing: wallpaper, cork, plaster. 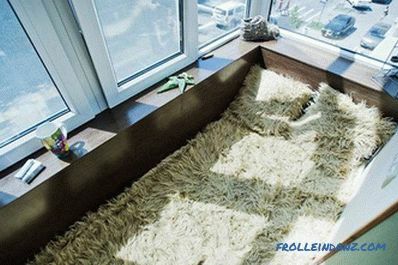 You can put a laminate floor on the floor, a cork, in the area of ​​the Swedish wall a hard mat. The situation should be minimalistic, so that nothing complicates the classes and does not fall due to careless movements. Ventilation should be considered especially well in the gym. Opening sash should not interfere with sports equipment. 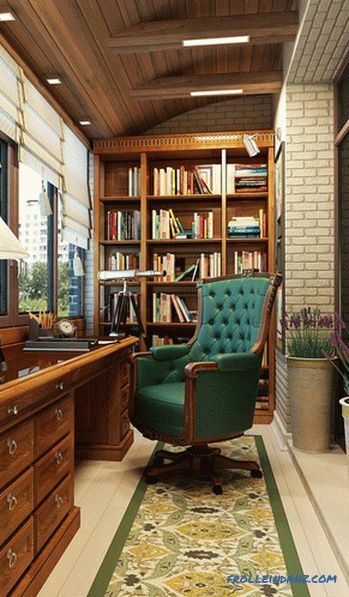 Perhaps the best it’s hard to think of a place than a balcony or a loggia for a library, even a small space doesn’t interfere, but, on the contrary, is good. Here you can retire and relax comfortably. It is very simple to equip the library on the loggia and, if it is already insulated and glazed, it will take quite a bit of time and effort. 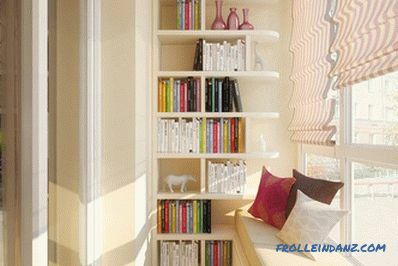 The most necessary details: a bookcase, and better a rack - one or more, which can be placed near the end walls or in the corners, depending on what the layout of the loggia and where the blank walls are located; comfortable chair or sofa, depending on what is available, based on the dimensions of the room. Not be superfluous and a place for snacking. 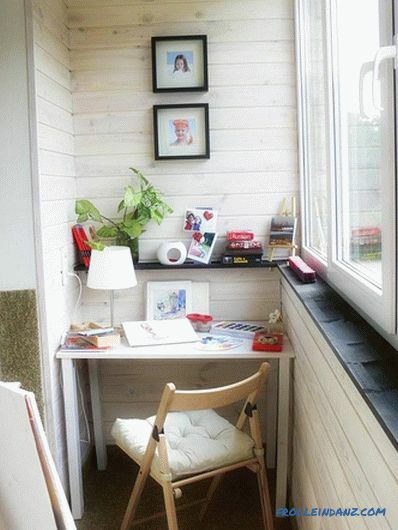 To this end, you can install a small table, build a windowsill, or make a folding tabletop. 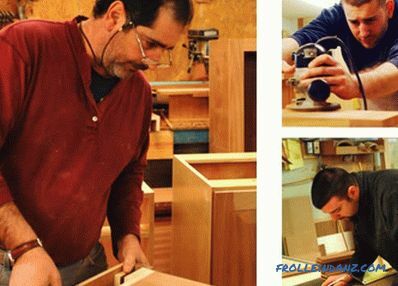 The choice of finishing materials is extremely wide and depends on your taste, it is preferable to choose neutral colors for finishing. 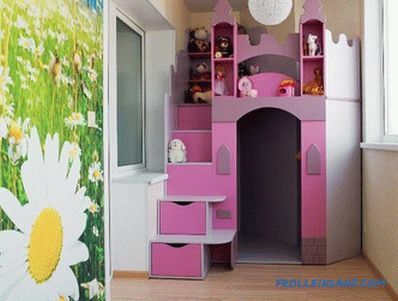 In principle, the requirements for the design of the playroom on the balcony are the same as for the design of the playroom in any room. 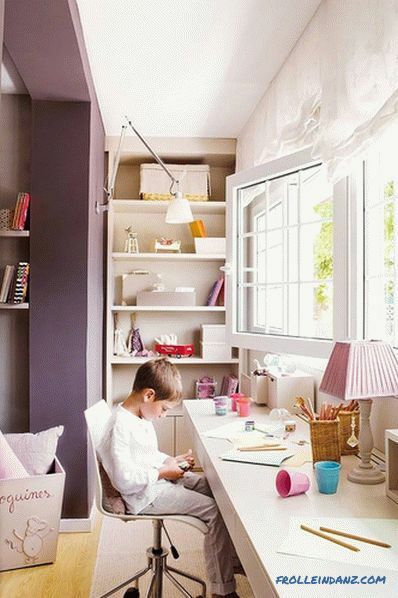 It is necessary to choose natural eco-friendly materials and think about the safety of the child, which is especially important in view of the limited space and proximity of the window. 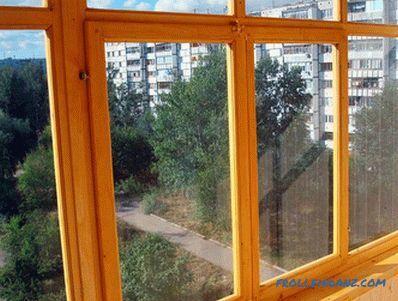 It is recommended to put the lattice on the windows and make it so that the child could not open the window by himself. 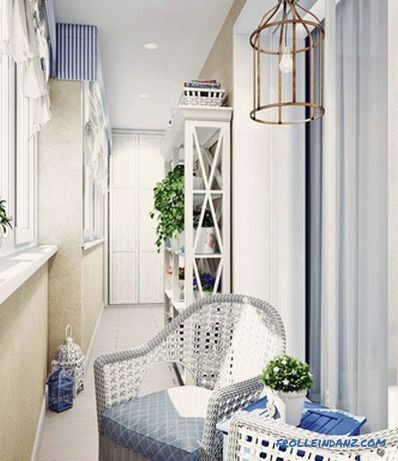 Despite the small space, a balcony or loggia should somehow be divided into zones, providing space for playing on the floor, storing toys and quiet games, such as drawing or modeling. To prevent the child from hitting once more during active games, use soft materials such as cork to finish the walls and floor. 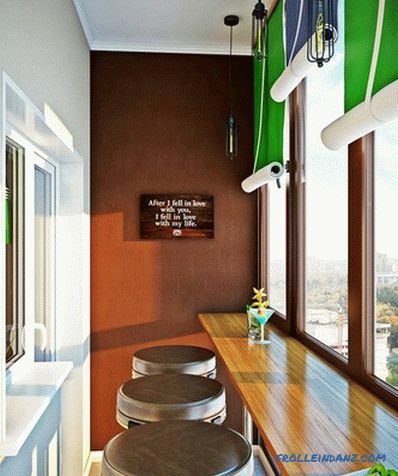 The design of the game room must be bright and cheerful. One of the most radical examples of balcony re-equipment is the kitchen. 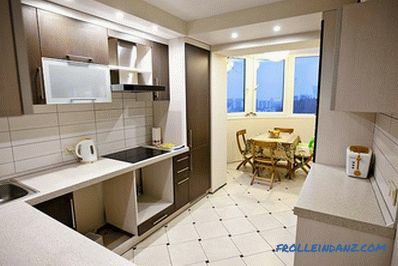 Such a decision may arise if you want to make a dining room from the room in which the kitchen used to be, or you plan to qualitatively change the destination, turning it into a bedroom or children's room, for example. If you plan a radical transfer of the kitchen to the balcony, be prepared for the fact that you will have to bring not only electricity to the balcony, but also sewers with running water. It is precisely with this that there may be difficulties, both technically and legally, as if you try to legitimize redevelopment, you can get either a categorical refusal or you will have to go for a long time to the instances. The gas stove cannot be installed on the balcony in any case. The pipes can be hidden in the floor, however, most likely, the floor will have to be raised significantly, as the pipes should be placed under a slope. 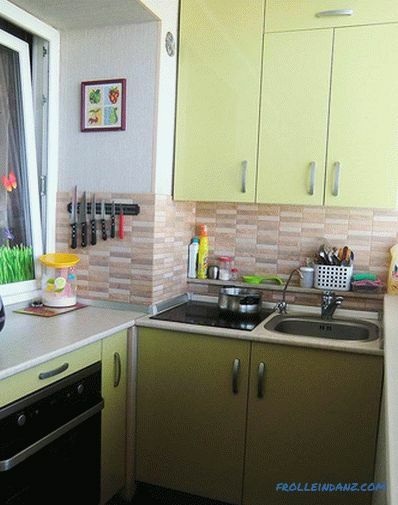 Electrical cable can be laid in the grooves or an external cable channel, and the cable itself should be of sufficient cross section to avoid overheating and unpleasant consequences, because there are many electrical appliances in the kitchen. One electric kettle is worth something. 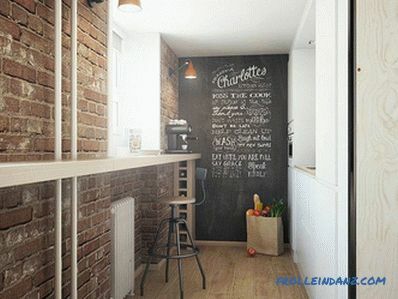 Furniture for the kitchen, choose small and built-in. 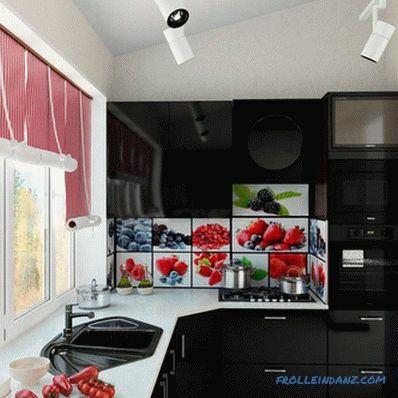 In such a kitchen you can place a small sink, a two-stove electric stove, even a refrigerator with a dining area. Especially successful decision when the removal of the balcony on the window sill and the wide window sill becomes the dining table. The set can be located both at the end wall and the letter "G". You can place the lower cabinets around the perimeter, then there will be plenty of space for storing a variety of kitchen utensils. Washable materials should be selected for wall finishing. As for the ceiling, the best option would be a tension design. If the kitchen has a balcony, it is advisable to make a dining room from the balcony to expand a working zone in kitchen at the expense of the formed free space. The kitchen can be either combined with a balcony or left isolated. 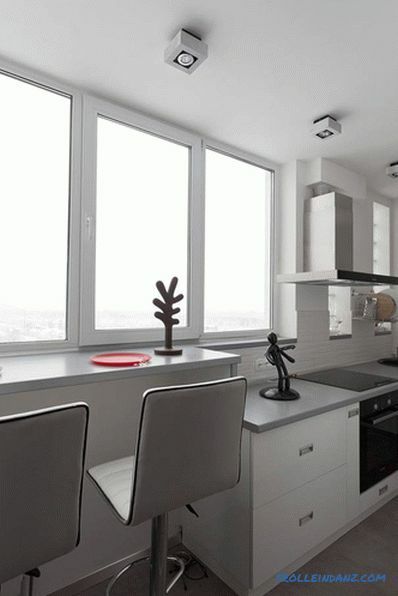 Combining the kitchen and balcony, like any redevelopment, will have to be legalized. 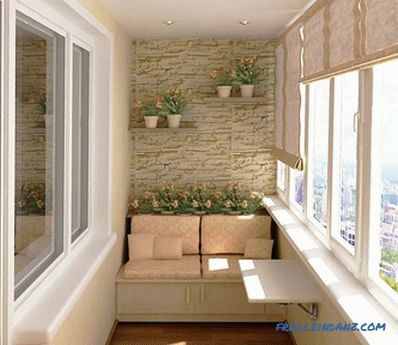 Specify in advance whether it is possible to demolish the balcony partition and dismantle the window, in many houses this part of the wall serves as a carrier. So that the furniture does not interfere with the opening of the door, it is most convenient to replace it with a sliding one. The balcony must be sufficiently insulated, all the gaps are sealed to avoid drafts. 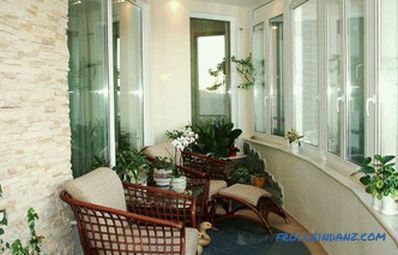 In general, you can organize a cozy dining room on the balcony, where you can enjoy your meal at any time of the year. 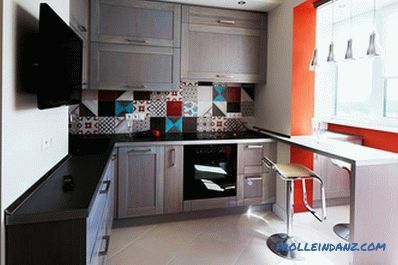 It is appropriate to make the design of the dining room and kitchen in the same style. It would seem that there is a sauna on the balcony. But if you wish, this idea can be embodied. 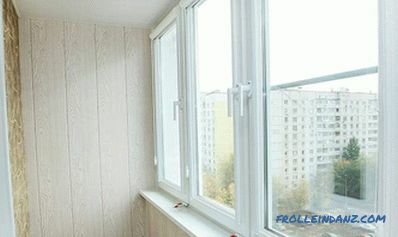 Ready-made small saunas for balconies in unassembled form are sold, however, the size of the balcony will have to be adjusted to such constructions, you may have to expand it. 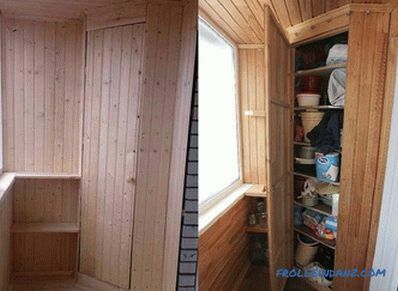 You can make a sauna yourself, using individual sizes. 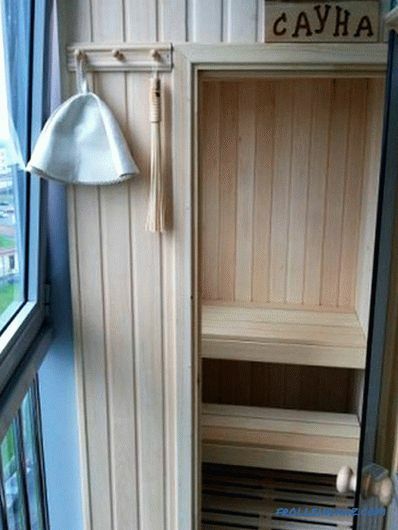 The size of the sauna should be at least 80 * 80 cm in width and length and 2.1 m in height, otherwise it will be extremely uncomfortable. 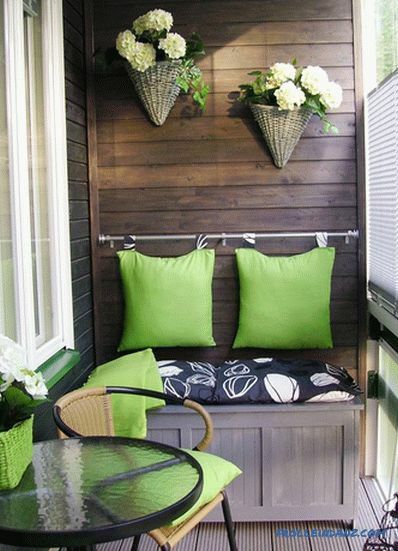 Balcony decoration, if the sauna is located there, can be carried out with the help of wood, plastic or glass. The tree, of course, will look more authentic. You can use the lining or even blockhouse. 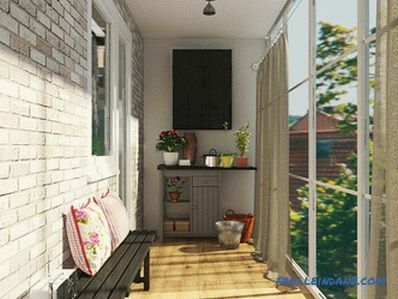 But still, the main requirements for the balcony are not design, but technical - this is good insulation, ventilation and well-supplied electricity for connecting an electric stove. As soon as people do not leave the cramped living conditions, they even organize a bedroom on the balcony. Why are there "even", this is one of the most popular solutions. 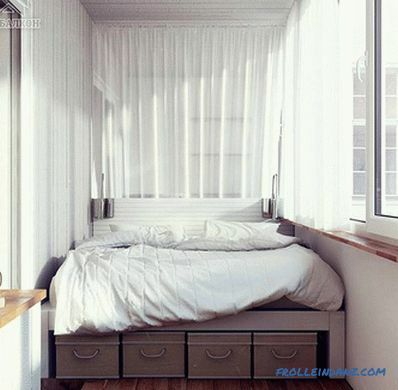 The main problem is the narrow space, so a double bed on many balconies and loggias will not work. When thinking about the design of the bedroom on the balcony, you need to carefully select the bed. You can order a finished version. It is best to make the bed on the entire width of the balcony - it is convenient. Conservatives can choose traditional beds, many will like the bed with a folding mechanism, and amateur masters can make the bed themselves. It's simple. It will be necessary only to knock down the frame of the timber, sheathe it on top with plywood and put a mattress. You can make a small side of the same plywood to the mattress did not move out. That's all. And under an improvised bed you can store something, for example, in drawers. There is no place to put bedside tables, except for one in the legs, if the length permits, but the window sill or shelves on the wall at the head can play its role. As regards the decoration, in view of the close space of materials, it is necessary to choose light colors, they will visually make the room a little wider. Lighting can be point. Do not give up and dimmed lighting, which will create a romantic atmosphere. Enough will be two wall lights. Remember that a balcony and a loggia are places where there is a lot of light. If you do not want to wake up with roosters, then install blinds on the windows or hang thick curtains. 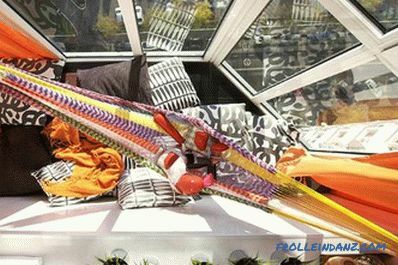 A necessary stage in organizing a bedroom on the balcony is high-quality insulation, sound insulation, and of course installation of heating, of course. That's what, and the toilet on the balcony is an unexpected laugh. But those who are in cramped housing conditions, for example, live in a communal flat, are definitely not funny. Of course, no one will allow you to use the toilet on the balcony according to the law. But if you have already decided, then think about a good hydro, sound insulation, as well as about how the sewage pipe will pass. You can expand the window sill and make a bar counter out of it and put bar stools - this option is relevant for the balconies adjoining the kitchen, and in the cases you can store conservation. 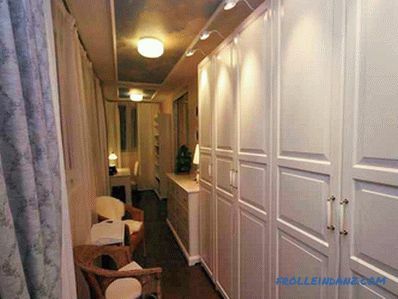 A dressing room can be made on the balcony , you can combine a dressing room and the same pantry. 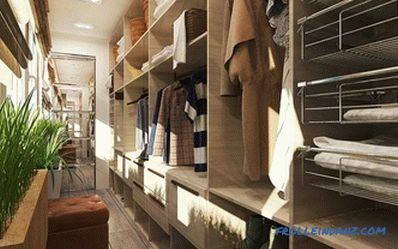 The dressing room is equipped with either closed cabinets or an open storage system. If the latter is chosen, then it is necessary to protect things from light with the help of blinds or curtains, otherwise they will burn out. 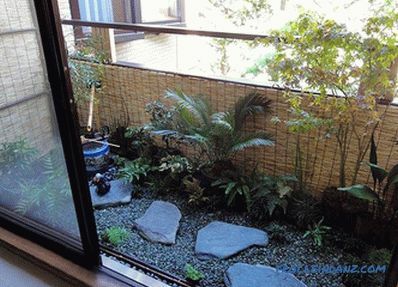 It is clear that the balcony with glazing more functional than without it. In the summer, you can shut off dust, precipitation and insects, in the winter you can maintain a comfortable temperature, however, it depends on what type of glazing you choose. There are two main types of glazing: cold and warm. Performs the same functions as warm, except for the accumulation of heat. Because of the design features, cold glazing cannot provide sufficient sealing, so heat is simply blown out by a draft. Cold-glazed windows can be aluminum or plastic.The second will be warmer, although there will still not be a comfortable temperature on the balcony in the winter in frost. 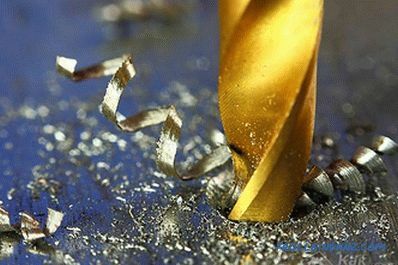 Metals have a high conductivity of cold and heat, and aluminum, as is well known, is one of them. This explains partly the main and only drawback of aluminum structures. Subspecies of cold aluminum glazing include frameless glazing, which looks very modern. 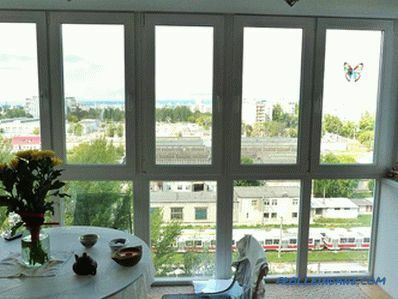 Thanks to the frameless glazing, you can organize a panoramic view, because no frames and lintels will be in sight. Yes, and to abandon the fresh air in the summer will not have to, because the sash move, hiding one after the other. 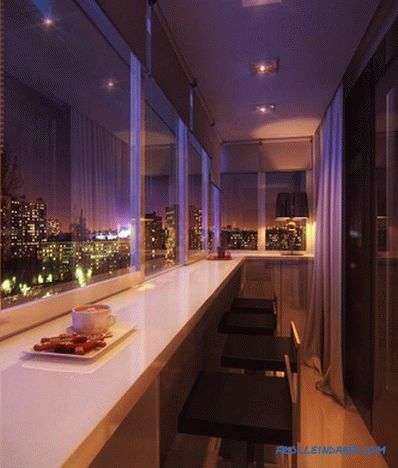 The construction is light, which allows installing glazing without fear on the balconies with removal. Usually no serious work is needed to strengthen the parapet. 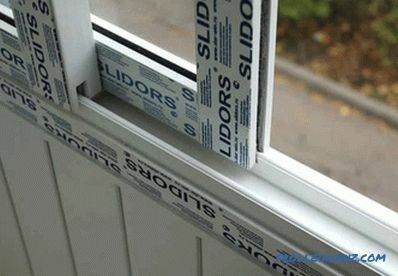 It is easy to care for the glazing - it is necessary to lubricate the rollers and keep the glass clean, that goes without saying. 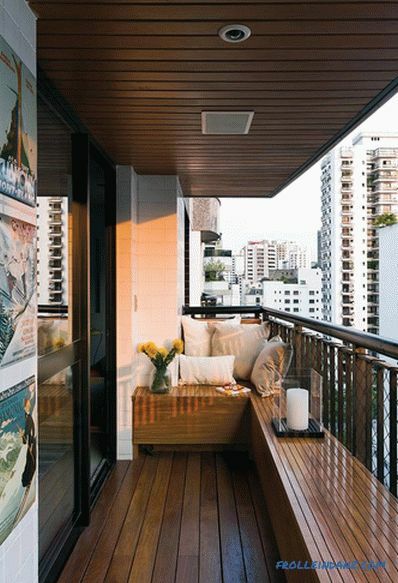 You will have to sacrifice only the possibility of connecting a balcony or loggia to the room, as well as noise insulation: no tightness - no sound insulation. 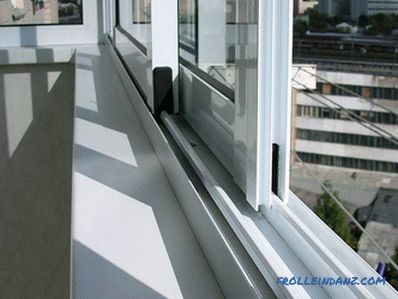 Plastic cold glazing (sliding type) will provide a higher level tightness and sound insulation, but this is still not enough for a comfortable stay on the balcony all year round. This glazing is done with metal-plastic constructions. If you install a warm glazing and insulate the balcony, then it will be possible to maintain the same temperature as in the apartment at any time of the year. This type of glazing is necessary if it is decided to attach a balcony or loggia to a room or organize a functional room there, and a double-glazed window will provide the best thermal and noise insulation. Massive, which makes it impossible to install metal-plastic structures without additional reinforcement, especially if the balcony is old or old. 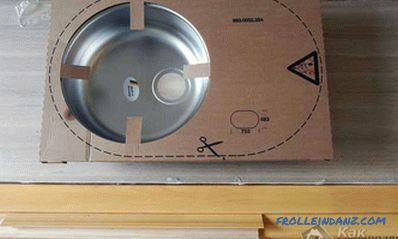 Capital works, up to replacement of a balcony plate can be required. 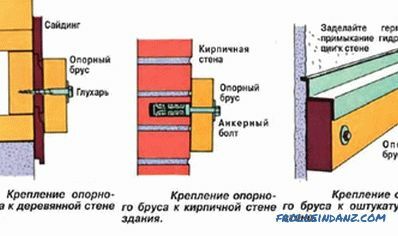 Condensate during the cold season. Here it is - the other side of the same coin. Noise isolation is good, but due to excessive tightness of steam, which is formed in the room, is not removed, because there is simply no natural ventilation. As a result, there is a high risk of mold and mildew. It can be plastic, and aluminum, and frameless. It is obvious that with a panoramic glazing the degree of illumination of both the balcony and the adjoining room significantly increases, for example, if you remove the balcony unit and make a sliding door with the same panoramic glazing. Lack of a barrier for sunshine. Depending on the design, it may be difficult to wash the windows. Viewable from the street. If you see more, then passers-by also see more. By the way, the lower part of the panoramic glazing is sometimes mirrored or obscured. 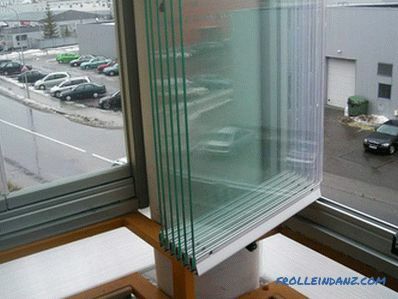 Technological solutions are also possible, such as electrochromic glass, which makes it possible to change the light transmittance using the control panel, as well as energy-saving glass, which retains infrared rays. Above we talked only about aluminum and metal-plastic constructions, but no one ignores wooden glazing, in some cases wood even more appropriate than metal and plastic. Yes, and with the environmental friendliness of the tree does not compare either one to the other. It is important that the wooden glazing is suitable for both cold and warm glazing. Just in one case, insert simple glass, and in the other - double-glazed windows. If you look after a wooden glazing properly, it can last for more than 20 years. 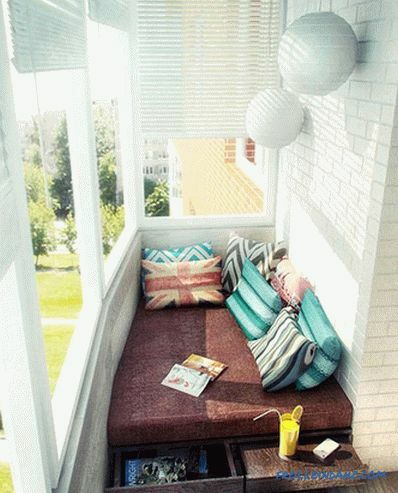 One can't help but mention interesting ideas for finishing the balcony. 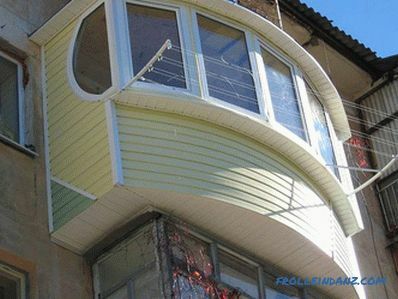 Traditionally for finishing of a balcony use lining and plastic panels. Such options are the most common, but in them, of course, there is no zest. We suggest using photo ideas from the compilation below. These are interesting variants of the embodiment of some style trends in the decoration and decor of the balcony. From the point of view of balcony design, several styles are interesting. 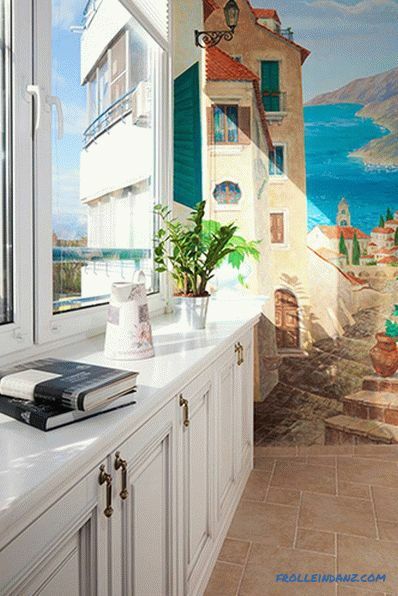 Mediterranean style . 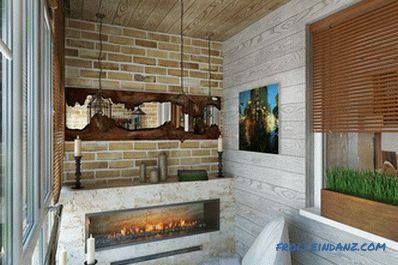 This is a simple and functional style that uses natural light colors and natural materials: wood, stone, glass, ceramics. The highlight of the finish can be a drawing on wet plaster. In other words, the fresco. Country . Rustic style has many varieties. But the essence boils down to one thing: a cozy atmosphere of a rural house is created. Used a lot of textiles with small floral pattern or cage, lace. The colors are light bleached or natural wood. Unusual finish inside - unedged board or slab. 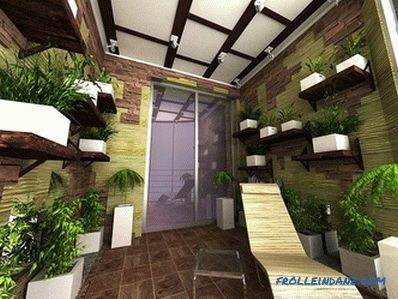 In Provence style pergola will be appropriate along the wall for climbing plants. Japanese style . 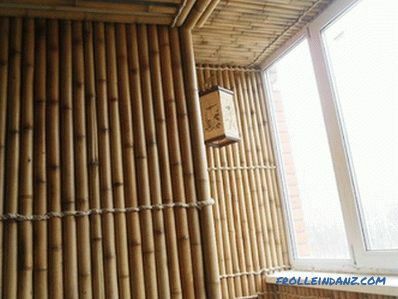 A distinctive feature of Japanese culture is a reverent attitude to bamboo, so bamboo wallpaper when creating an interior in the Japanese style on the balcony will be in place. Moroccan style. 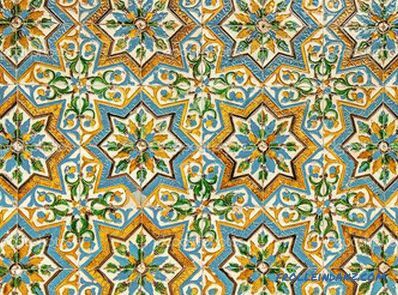 The highlight of the Moroccan style is a special Zeleezh tile, which is folded into small and fancy ornaments. 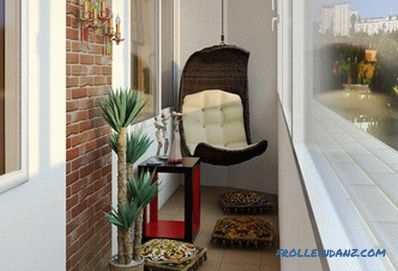 That she can finish the walls of the balcony, if you ask to create an interior in the Moroccan style. Loft. As you know, the interior in the style of a loft should somehow resemble a former factory or warehouse. The walls should look as if they were not processed. Therefore, they trim the clinker brick. Demonstration of any metal mechanisms and art objects is appropriate. Even if it is an old sewing machine. 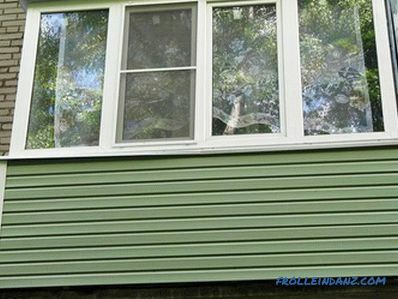 If the balcony parapet is concrete, then siding, plastic panels, and a profile sheet are used to finish the balcony parapet. A new material is interesting - flexible ceramic tile, it is not bad for finishing the balcony outside, because it weighs little and is easily glued. It is eco-friendly and easy to use. 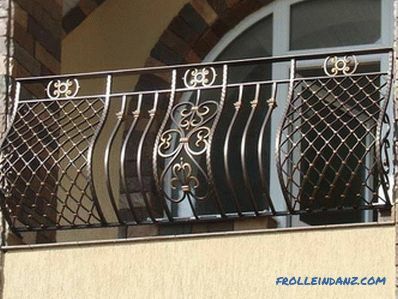 If the balcony fence is metallic and already looks unattractive, you can dismantle it and install the wrought iron railings on the balcony. 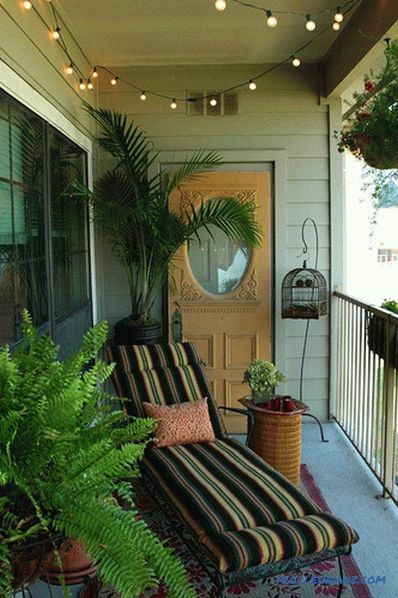 If you want to have a really cozy balcony, you can not do without furniture and decor. What can be on the balcony? A table and a pair of chairs . You will definitely need to have a cup of coffee or a snack in the morning, breathing fresh air. 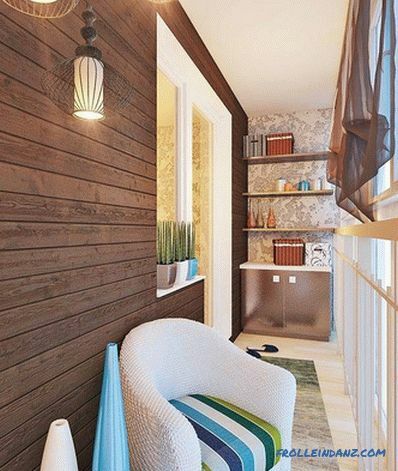 With a limited balcony space, choose folding furniture, you can put it in the closet and make the balcony spacious. 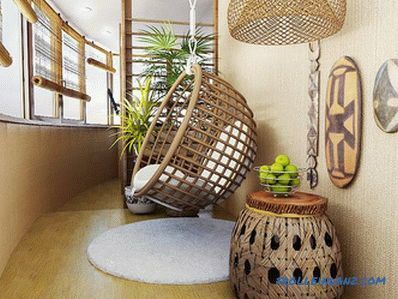 The interior of the balcony organically looks rattan furniture and wicker furniture. Bench . 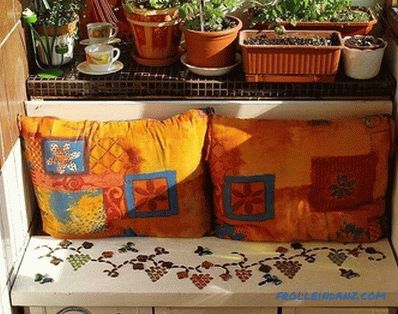 If your balcony has a small garden, place a bench there: wrought-iron or wooden. Landscape style is now in fashion. Sofa . Want more comfort? Then choose a sofa, it is not necessary to buy an expensive sofa for a balcony, but also to pull out the old one to nothing. 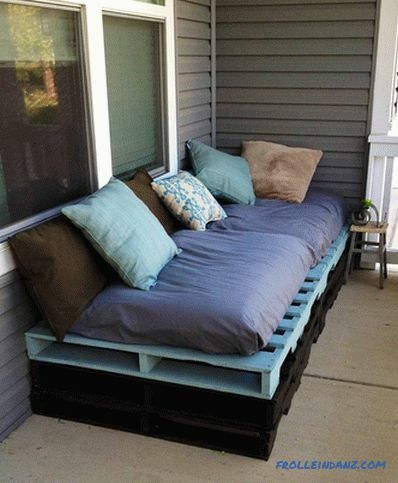 Much more interesting on the balcony will look a sofa of pallets with bright cushions instead of a seat and backrest. Hammock . Exit, if there is no place to put a sofa, but I want to lie on the balcony. Deckchair . If all of the above is not to your liking, then choose a deck chair. And you can take a nap, and sunbathe, taking a comfortable position of the body. Pillows and puffs . If you wish, you can completely abandon the furniture, put pillows on the floor and make the balcony a place for holding tea ceremonies. Shelf . It is very convenient to arrange pots with flowers on the shelf. Designs can be the simplest or performed in a particular style. The main thing is that it is sustainable. The decor on the balcony can be no different from that in the apartment, of especially interesting ideas, it should be noted vertical garden, mini-pond, fireplace, round bird cages.
. We hope that you will be able to choose one or more ideas for your own balcony or loggia, and we offer to see a few more photos and balcony interior design projects.